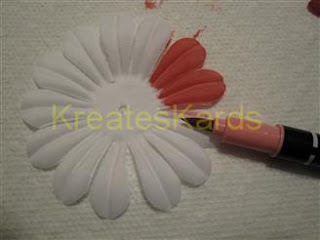 Wait till you see this great way to make a white silk flower any color you want !!!!! The other day I reviewed the Stampin' Up! Pretties Kit on Pg 178, item # 109114. Here's the link if you would like to see that review. I had seen a couple of blogs where others had changed the color of their silk flowers, so I had to give it a try too. It is so easy to do. The Pretties Kit is LOADED with silk flowers, rhinestone brads, hat pins, pearls, half pearls and more. This is what my finished silk flower looks like. I love the contrast of the colors and the elegance of the added pearl to the center. The pearl is a half pearl (totally flat on one side). I used the largest flower of the silk flowers and one of the smaller ones. Since this project uses water and the markers I highly recommend that you do this on a covered surface with lots of paper towels. 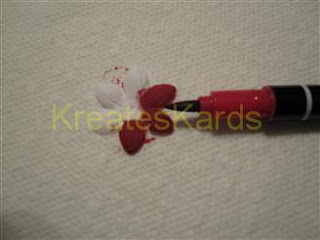 Using the Rose Red Stampin' Write marker, item #100063 I colored in the petals of the small flower. You can do this as dark as you would like. Remember when you mist it the colors will lighten. Experiment too with just coloring the edges or coloring in streaks then spraying. I wanted an overall color effect so coloring in the full petal was my choice. Here's the completed small flower. I left the center white. Using the Regal Rose Stampin' Write marker, item #105108, I colored in the petals of the large flower. I'm working with layers of paper towels underneath. The ink will bleed thru, especially after misting. Here are the two completed flowers. There are some white areas on the petals showing, that is OK. Misting will bleed the colors together and make them more uniform. I intentionally left the center white of both flowers. Using a small mister, I saturated both flowers with water. If there are any areas you want more color in, just redo the process above in that area. I'm not concerned about the white of the large flower center as the small flower will be placed on top. Allow flowers to thoroughly dry before layering. 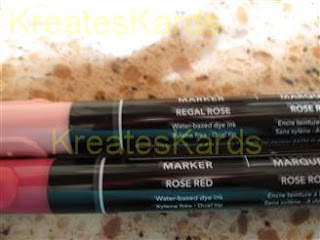 Here are the two Stampin' Write Markers that I used. You can color your silk flower any color that you would like. 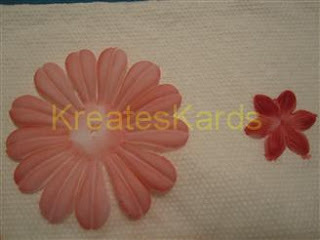 Layer the small flower on top of the large flower using Mini Glue Dots, item #103683 on Pg 192. I used 3 of them to adhere the two flowers together. Also using two mini glue dots, I put the half white pearl in the center. The kit has both white and cream/ivory pearls in many sizes ... choose the one that best suits your flower. 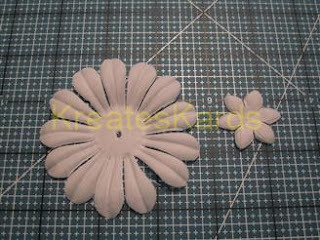 Remember the silk flowers may be done in any color you would like to use. There are so many choices of colors using the Stampin' Write Markers. Won't this be a perfect addition to a card or even to a ribbon on a package. I think the result is very elegant, and so very easy to do. There are just 2 more shopping days to participate in the Chance to Win Drawing. It ends at midnight on October 31st and the drawing will be November 1st. Winner's first name and last initial will be posted here on my blog on the 1st. Orders may be placed directly thru me or thru my Stampin' Up Website. The final deals of the week are from October 26, 10 AM (MT) through October 31, 11:50 PM (MT). Hoist the Jolly Roger and get ready to have a swashbuckling good time! Gather your little buccaneer and his or her mateys for a pirate party of the finest sort, complete with invitations, decorations, and eye patches to create and wear. This kit contains products you need to create party invitations and decorations for eight guests. You can make your princess's fantasies come true with our Princess Party kit. Your little princess and seven of her ladies-in-waiting can celebrate a splendid happily-ever-after complete with invitations, decorations, and dazzling crowns to create and wear. I received this kit about a week ago from Stampin' Up! as a reward for my sales last quarter. I was so excited to get it as it was an item I had not purchased or tried yet. I was amazed at all the items in the kit and the storage container is an added plus as it is reusable. 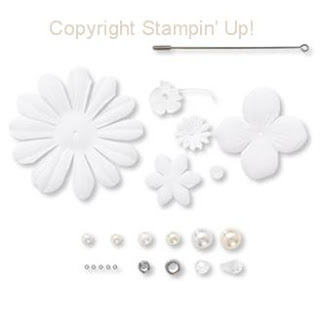 I have seen the hat pins used as the body for butterflies; the flat back pearls as accents and centers to flowers; and even the white flower dyed using Stampin' Write Markers (look for a tutorial this week on how to do this technique). This kit will definitely give your projects the WOW factor. 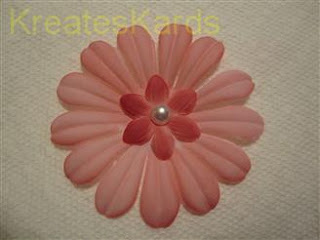 Wouldn't the pearls and/or the rhinestone brads be elegant on a wedding card or bridal shower card!!! Any project could easily be dressed up using this. Just a reminder too that this is the last week to get your name into the Chance to Win Drawing by placing an order thru me. If you have any questions, please feel free to contact me. 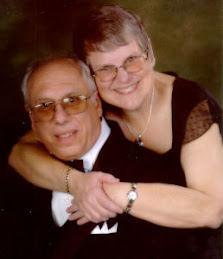 Orders may be placed by contacting me directly OR ordering thru my Stampin' Up Website where you can order 24 hours a day. 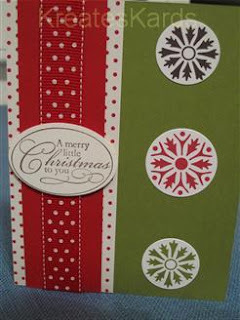 Here's is Part 2 of my creations using the Simply Scrappin' Christmas Jingle Kit from Stampin' Up!. If you missed Part 1 you can see it HERE. 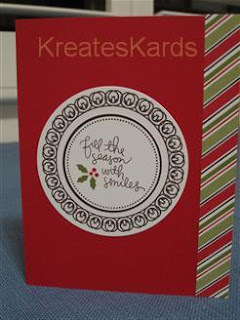 This is so easy to use and a great way to make quick and easy cards. I did use additional card stock (11 sheets) to make my 21 cards. I used it for the card bases and then used the kit to embellish and accent. 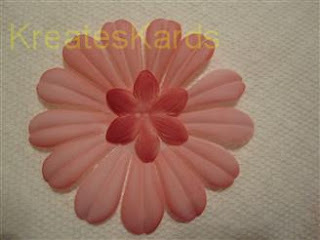 I made layers using the Scallop Edge punch, item #112091. Don't you love the cute little Santa. He's from the Christmas Punch Level Two Stamp set. I accented the card with 1/4" chocolate chip grosgrain ribbon, item #111367 and a chocolate chip flower brad (item #112579). 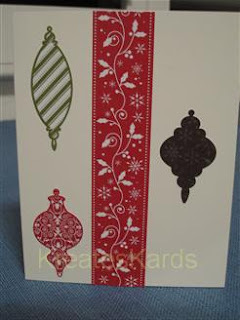 The scallop border across the top is from the die cut borders in the kit as are the designer series paper and chocolate chip textured card stock used in this card. Lots of layering going on in this card. I like the mix of the solids, the dots, and the stripes. Think it makes the card more festive and bright. 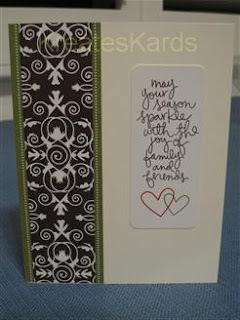 Season's Greetings is from Snow Swirled stamp set, item #111690. 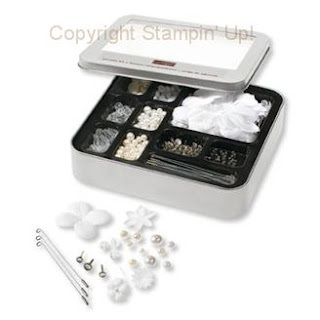 I just couldn't make holiday cards without using my Delightful Decorations stamp set, item # 116517. I punched the stamped ornament shapes out using the Ornament Punch, item #116794. 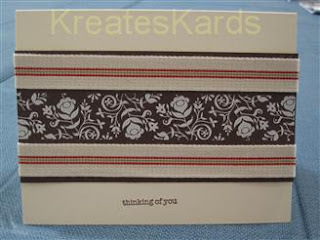 To accent the card, I used the solid color side of the 3/4" Polka-Dot Grosgrain Ribbon in Real Red, item #115608. The other side is polka dots. 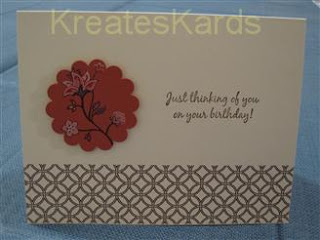 The beautiful chocolate chip and creamy vanilla border is a die cut. Simple and easy and all done with die cuts in the kit. 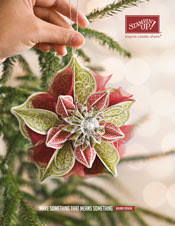 I punched out ornaments using the designer series paper in the kit using the Ornament Punch, item #116794. The rest of the designs are die cuts from the kit. I used red glitter glue on the ornament caps. Using my Stampin' Up! 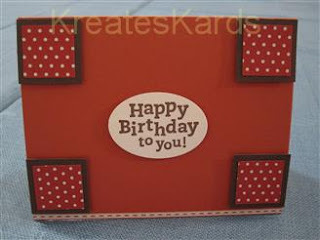 Big Shot and designer series paper in the kit, I cut out a Top Note die in red polka dots. The Top Note Die is a BigZ die that is exclusive to Stampin' Up! and is item #113463. 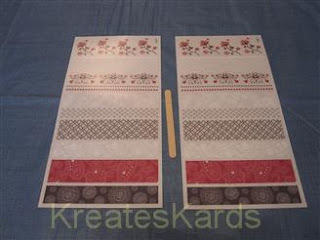 Earlier I mentioned cutting the borders die cuts at 5 1/2 " and 11" which left 1 inch. I used the inch pieces to make little boxes placing them on Whisper White Organza Ribbon, item #114319, which is 5/8" wide. 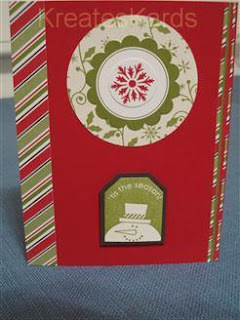 The oval design was made with the Holiday Best Hostess Level 1 stamp set and real red classic ink. I made the stitch marks on the Chocolate Chip card stock using the Uni-Ball Signo Gel pen, item #105021. Really adds to the look of the card. The tiny stripes at the bottom were what was left on the protective sheet when the larger border was pulled off. 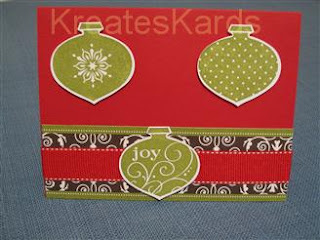 I used Christmas Punch Hostess Level 2 stamp set, item 115366, the sentiment. Everything on this card is from the kit. It is nice that everything coordinates so well together, and is great to layer. The little gift boxes were made with the leftover border die cuts. 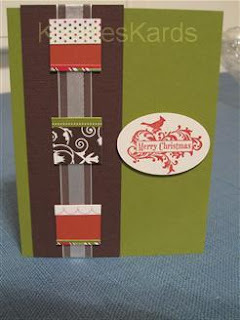 I layered them on real red card stock and added a 1/4" whisper white grosgrain ribbon, item #109025. For the Merry Christmas, you could use Christmas Greetings, item #115448. I plan to stamp a greeting inside of each card. Just haven't done that part yet. I highly recommend too that you sign the backs of your cards or use one of our personalized stamps found on pages 136 thru 137 of the idea book & catalog 2009 - 2010. If you have any questions, please contact me. Orders may be placed directly thru me or thru my Stampin' Up! on-line website, by clicking here. Then click on Shop Now in the upper right corner. Just a reminder too that there is just over a week left to enter the "chance to win" drawing. There is over $200 worth of Stampin' Up! products that I will be giving away to one lucky person. It just might be YOU! 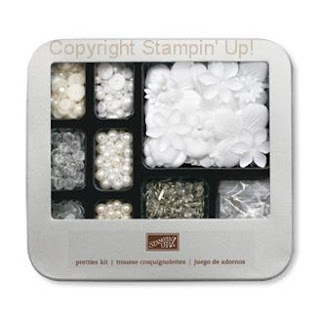 The other day on the message board, we were talking about the Simply Scrappin' kits that Stampin' Up! sells. Since my main passion is card making, I must admit I hadn't really look at these kits at all as a purchase for myself. 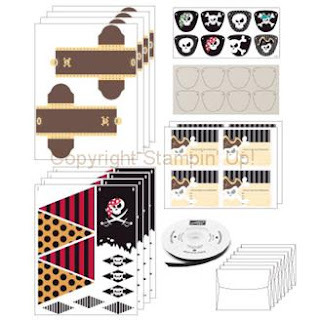 Barb (Snowmanlover) mentioned that she was doing a workshop using this kit and each person attending was going to make 12 cards from half of a kit. I ordered a kit and decided to put it to the test. First I did a review of what was in the kit and posted it to my blog. 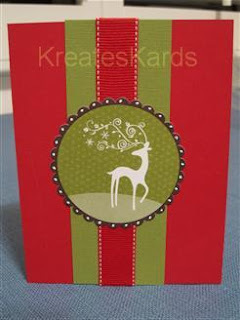 It was loaded with textured cardstock, designer series paper, and self-adhesive die cuts. Cards definitely could be made from those items and if you add in ribbon, a few of our wonderful stamps you can do even more. I did add 11 sheets of 8 1/2 x 11 card stock to use as my card bases. 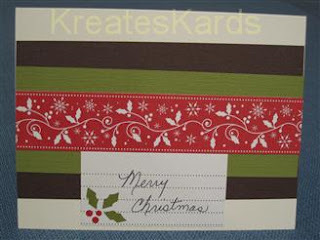 Then the items in the Simply Scrappin' Christmas Jingle kit could be used for accents, embellishments, etc. I must admit I was shocked when I was able to create 21 (yes, you read that correctly) cards from 1/2 of the kit. 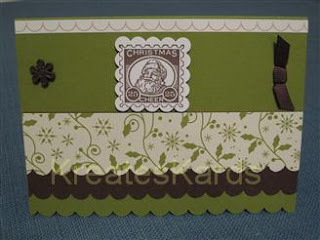 That means I could easily get 42 cards from this kit by adding in ribbon, a couple of stamps, and some imagination. You definitely could do this too. I hope some of you will try it. 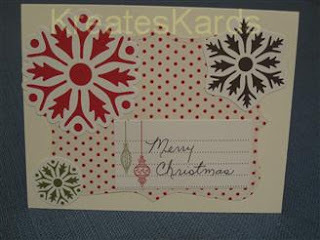 I absolutely love the red & white border die cut that I used in the middle of the card. I hand wrote the sentiment. I used the snowman from the Christmas Punch Hostess Level 2 set. The tiny borders on the right are actually scraps from the die cut. I thought they looked perfect on this card and they already were self-adhesive. This card was Hal's favorite. It is 100% from the kit. I used my Uni-Ball Signo White Gel Pen to write Merry Christmas. This pen is opague and works beautifully on any dark card stock. This card is my absolute favorite. I added in the ribbon (it's polka dot on the other side), along with using the Uni-Ball Signo pen to accent the scallop circle with white dots. There is such varitey in the borders and other die-cuts. The circle one is actually two that I layered. The sentiment is from the Christmas Punch Hostess Level 2 stamp set. 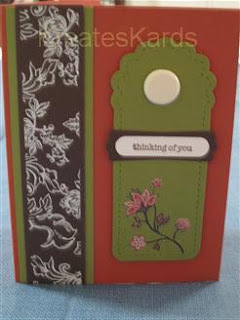 A simple card made 100% with the die cuts in the kit. Again, I only used 1/2 of what was in the kit. So there are many to choose from. I added in the polka dot ribbon (it is solid on the other side). Doesn't it look great with the polka dot paper. The ribbon is 3/4" wide and is called: 3/4" Polka Dot Grosgrain Ribbon, item #115608, Real Red. It is $8.95 for approximately 10 yards. 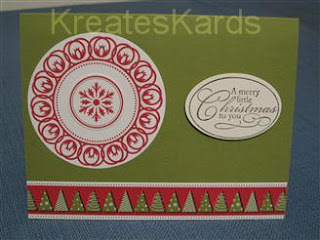 Another card done with die cuts and the circle one is actually two that were layered. I really like the striped borders. The borders are 12" wide in the kit. I cut them in at 5 1/2" and 11" since my cards are 4 1/4" x 5 1/2". 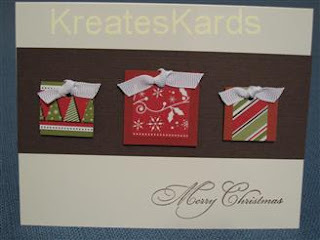 Then used the leftover end to create little boxes for a card too. The die cuts are so easy to use. They are self-adhesive so you peal the back and stick on the card exactly where you would like them. Quick and easy. The ornaments are die-cuts too. They are a perfect match to our stamp set called: Tree Trimmings, item #116722. This is card #11, I have 10 more that I will post tonight or tomorrow. Aren't the stars great! They are made using our star and our large star paper punches. You punch out the small star first, then line up the larger punch over the negative image on the card stock. 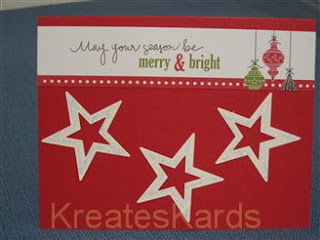 It creates this cute border star allowing the card base to show thru. Small star punch is item #109045 and large star is item #110710. 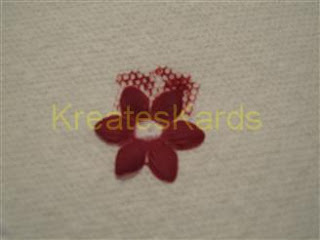 You can achieve the same effect using the small tag and the tag paper punches too. Small tag is item #108264 and the tag is item #105934. 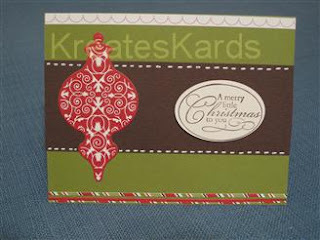 I was so pleased with the results of these cards that yesterday I ordered a second Simply Scrappin' Christmas Jingle kit. I would highly recommend these kits whether you use them for scrapbooking or for card making. They are really a great value and are easy to use. 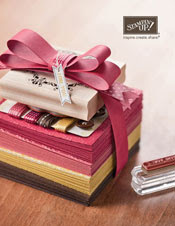 All of the Simply Scrappin' kits are on pages 164 through 167 of our main catalog (idea book & catalog 2009 - 2010). If you have any questions or would like to place an order, please contact me directly OR use my Stampin' Up! website and click on "Shop Now"
Be sure to check back for the additional 10 cards I made from 1/2 of this kit. The third deals of the week are from October 19, 10 AM (MT) through October 26, 9:50 AM (MT). You may contact me directly to place an order OR order thru my Stampin' Up! online store. 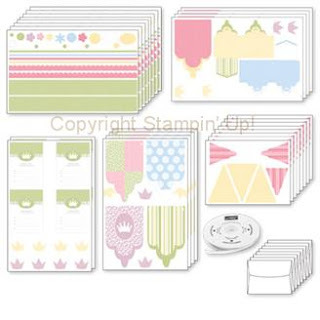 My blog post yesterday was a review of this product from Stampin' Up!. It is called Rub-Ons, Dots & Designs, item #115728 and is on Pg 176 of the catalog. Comes with 2 identical Rub-Ons sheets. Today I decided to challenge myself and see just how many cards I could come up with using just 1 of the 2 sheets in the kit. I was shocked when I made 8 and know that I could of made more if I had changed lay-outs just a bit. It was so much fun, and of course, I just had to share with all of you. I used Whisper White, Chocolate Chip, Old Olive, Ruby Red, and Very Vanilla as the solid papers. I also used Classic Inks: Chocolate Chip & Ruby Red. 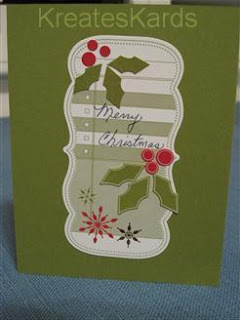 Card #1: All decorations were done with the Rub-Ons except for the greeting which is a rubber stamp image. 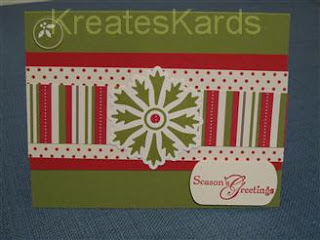 Card #2: All designs are from the kit and I stamped the greeting. It was fun to layer the colors and see what combinations I could come up with. 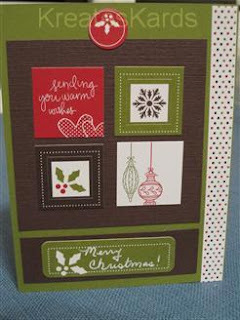 I also used the Tag die from the Big Shot, then added in a Jumbo Brad..
Card #3: The tiny multi-color dots are from a package of Designer Series Paper called Cottage Wall. The larger 2 circles (in the corners) are stamped images. The tiny dots and the flower are rub-ons. Card #4: The red border is from the Rub-Ons set. I stamped the flowers and the greeting using Ruby Red. The border was a perfect 5 1/2" wide so no trimming needed to put on my card base. 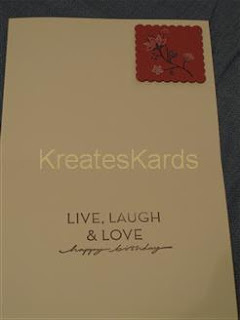 Card #5: Did you notice the tiny white border at the bottom? It is in the kit too. The white dots are part of a border from the kit and once I put it on the cardstock, I then used a paper punch to make tiny square and shadowed the square with Chocolate Chip. The greeting is a stamped image. 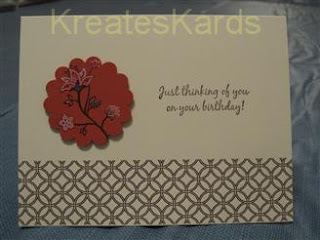 Card #6: The brown border at the bottom is from the Rub-Ons kit as is the floral design in the scallop circle. I did stamp the image. Card #7: When you have a brand new roll of ribbon, don't you want to use it right away at least on one project!! This is the sleigh bells ribbon in the Holiday Mini Catalog on Pg 17, but I really think it could be used year round. 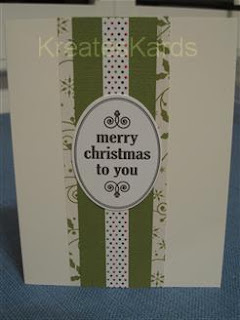 I placed the white rub-ons in the center of the card stock, then added in the ribbons, and adhered to the card. Greeting was stamped. Card #8: I think this is one of my favorits. It just looks so elegant and I think the Ronald McDonald House Charities Stamp set was a perfect choice which added in the bird and the Thank You. 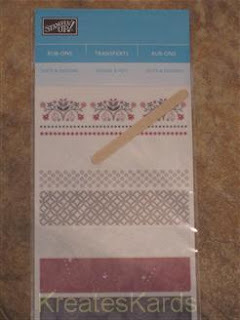 The white design brown border and the multi-color floral images are part of the Rub-Ons kit. 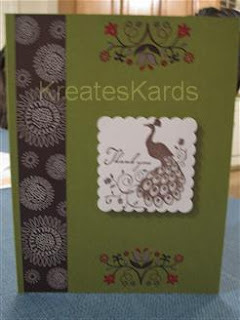 The peacock, swirls, and Thank You are a stamped image. Remember this was from just 1 sheet of the Rub-Ons kit. This kit would easily make 16 to 20 cards depending on the layout designs you choose to use. Hope you will try it. If you would like to place a Stampin' Up! order, please contact me directly OR you may order thru my on-line store. Don't forget that my promotion "Chance to Win" is still going on thru October 31st. Each package contains 2 sheets 5 7/8" x 12" along with a wooden stick to rub the images on card stock, patterned paper, or stamped image. Personally I like using the bone folder to rub the images on rather than the wooden stick. Both work fine, however the bone folder gives me a larger surface to work with. I picked this set because of the border pieces in it, and that the designs/colors would work whether for a male or female. The white areas actually have designs on them. 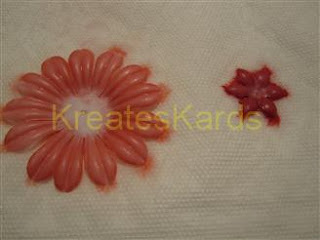 With rub-ons, you can use the full item or cut it to whatever length you would like. Just remember that the backing and the design need to be kept together until ready for use. I keep mine in their original bag and the smaller images I put in a zip-lock bag to keep them together. It is so quick and easy to make a card, but the cards are beautiful when complete. I made one in just a few minutes and am very pleased with the results. I used the brown lattice type border. It was a perfect fit for the 5 1/2" side of my card. No trimming needed. 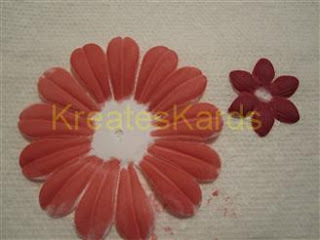 Then I took a piece of ruby red card stock and used a flower rub-on, then punched out with our scallop circle punch. Did similar for the inside but with a scallop square punch that I had (see photo below). Attached both using Dimensionals. 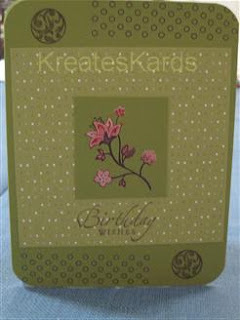 The stamp set I used on this card is called: On Your Birthday, item #111664 and is on Pg 139 of the catalog. I used the Classic Chocolate Chip Stamp Pad with the stamps. 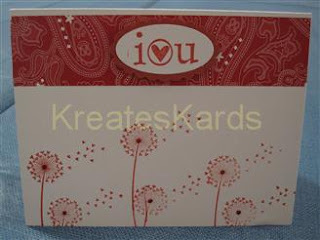 This would be a perfect gift for anyone who loves card making, scrapbooking or crafts. Also a great idea for someone just starting out. There are many more sets of rub-ons in our catalog on pages 176 through pages 177 AND on page 27 of the Holiday Mini Catalog. The ones in the Holiday Mini Catalog are metallic and will add a great accent to a holiday greeting or scrapbook. Definitely would recommend the Stampin' Up! Rub-Ons. Hope you will try them too. If you have any questions or would like to place an order, contact me directly or place your order thru my on-line store. Click on image to place your order. Click on the photo to view the catalog. Click photo to see PDF of downloads.